If you are feeling the looming stress of loads of required reading this summer, take a deep breath and relax. It will get done, and since it is summer, you should give yourself a bit of break too. 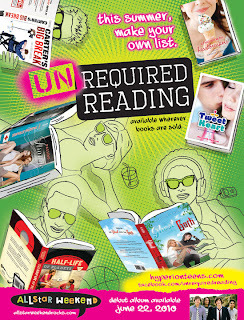 Enter in unREQUIREDREADING--a group of books from Hyperion that are smart and entertaining, and best of all, no one will quiz you on them when you're finished! The books are The Ghost and the Goth by Stacey Kade, A Field Guide for Heartbreakers by Kristen Tracy, Carter's Big Break by Brent Crawford, Passing Strange (a Generation Dead book) by Daniel Waters, Tweet Heart by Elizabeth Rudnick, and The Half-Life of Planets by Emily Franklin and Brendan Halpin! You can learn more about them by checking out the official Facebook page and becoming a fan!